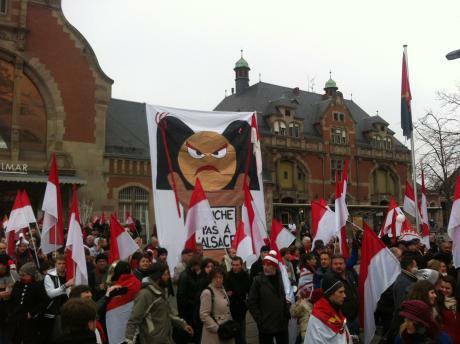 In the December I was asked by openDemocracy to write an article about the ongoing protests in Alsace. An ocean of red and white flags filled the streets of the Alsatian town Colmar last Satuday. A crowd of mostly young people was walking behind a banner that read “Alsatians we are, and Alsatians we will remain”. Slogans affirming the identity of this border-region were chanted both in French and in German. 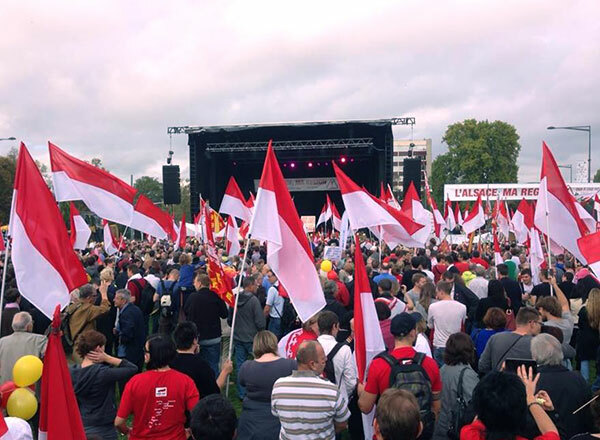 The crowd had responded to the call of the autonomist party Unser Land to demonstrate against the plans of the French state to merge the Alsace region in a “mega-region” with Lorraine and Champagne-Ardenne. This would effectively deny Alsace any political existence. Alsace to Paris: Can you hear us? This is an article I wrote for the Daily Wales. “We are fed up that people who do not know us, decide for us”. Maybe this is the banner that best summarised why an estimated 6,500 to 15,000 protesters (depending on the sources) took to the streets in Strasbourg, the capital of the French region Alsace, two weeks ago. The protesters followed the call of regional activists and politicians to demonstrate against the proposed plan of the French government to administratively merge their region with two other regions.